One of the biggest advancements in dentistry in recent years is our improved understanding of gum disease. Gum recession was once considered to be a normal part of the aging process. But dentists now regard it as treatable and have identified a number of diseases with which it shares high rates of comorbidity. While exciting investigations into causative relationships between gum disease treatments and other diseases are ongoing, it is important for patients to be up-to-date on what is already known about prevention. Gingivitis is the early form of gum disease. It is so common that when many people notice symptoms, such as seeing blood when they spit their toothpaste, they do not realize there is anything wrong. Inflamed gums will look swollen and discolored, but gingivitis is usually not evident until it has already progressed relatively far. It may also cause bad breath. 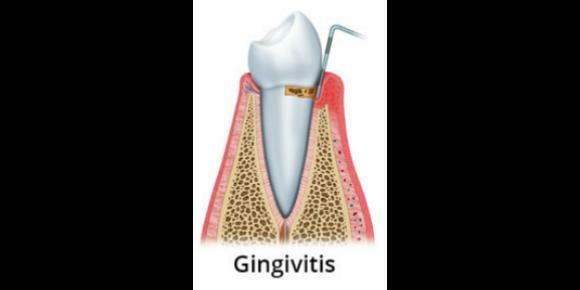 There are many things that could cause gingivitis, including injuries, autoimmune disorders, and hormonal fluctuations associated with puberty and pregnancy. But what most often causes gingivitis to progress is plaque. This build-up on the teeth’s bio-film is caused by bacteria consuming food and producing acid. As plaque hardens into tartar or calculus, the gums become irritated and the acid erodes enamel. This process is also responsible for tooth decay. Periodontitis is the more advanced form of gum disease. It is not inevitable—particularly not when gingivitis is caused by plaque. But the damage it causes can be permanent. When gums are inflamed for a long time, their tissue breaks down, causing them to recede. The exposed tooth roots are more sensitive than crowns, making it painful for the patient to eat or drink cold substances. If enough gum tissue is lost, and if the inflammation gets bad enough to break down bone tissue, the teeth may also come loose. When an implant is coming loose as a result of gum and bone break-down, we call it peri-implantitis. People who neglect their oral hygiene are at high risk for developing gum disease, but only a dental professional can remove calculus that has already formed. Smoking puts people at a significantly higher risk for periodontal disease (as well as oral cancer), which is part of the reason why it is more common in older people. However, quitting smoking reduces the risk, as does reducing stress and sugar intake. People with diabetes are also at increased risk for gum disease and should think of their dentist as an integral part of their care team.